Massachusetts metallers ALL THAT REMAINS recently completed recording their new album at a California studio for a tentative January 2015 release via Razor & Tie. The follow-up to 2012's "A War You Cannot Win" was helmed by producer Josh Wilbur, who has previously worked with LAMB OF GOD and GOJIRA. During an interview on HATEBREED frontman Jamey Jasta's official podcast, "The Jasta Show", ALL THAT REMAINS singer Phil Labonte said (hear audio below): "I think this record is far and away better than our last one [2012's 'A War You Cannot Win']. It's, in my opinion, far and away better than [2008's] 'Overcome'." "'A War You Cannot Win' had some of our biggest singles. I think, overall, the record, in general, sucked. I think that [2010's] 'For We Are Many', in my opinion, 'For We Are Many' is one of our best records, [and], in my personal opinion, it's our best record. 'Overcome' has our biggest single ever. "If 'Two Weeks' was on 'A War Cannot Win', it would have been No. 1 for a long time. It's just that when you go to radio, you have to prove yourself. So 'Two Weeks' was really us pushing our way in, so I think it got to No. 6 or No. 5 or something. But I think that if it was now that we wrote that song, I think that it would be No. 1 for a while. "Personally, I think that we have a lot of songs [on the new album] that are better. "Honestly, the test for me is, like, when me and Josh [got] done — 'cause we wrote the melodies and the lyrics together; none of the vocals were done before I actually sat down with Josh. This is the first time that anyone has ever had any kind of input onto lyrics. "But Josh is the only guy that's actually worked with me about lyrics and stuff, and it's been completely wonderful." Asked if the new ALL THAT REMAINS album contains more singing or screaming than in the past, Labonte said: "I think the record overall is probably leaning 'sing-y.' We've got 12 songs, and there's probably four or five songs that are beginning to end singing. There's some screaming worked into two or three." Speaking to Josh Rundquist (a.k.a. 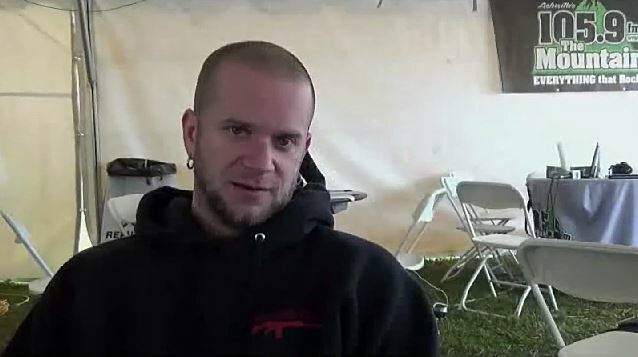 That Drummer Guy) on September 16 in Minneapolis, Minnesota, ALL THAT REMAINS drummer Jason Costa stated about the band's forthcoming CD: "Our label [has gone] through a lot of changes, as far as people who work there. And some of the new people that are just coming in, I don't know what they think that they expect from us. But we wrote a great album, and the guy who recorded our album, he absolutely loves it. And he's a Grammy-nominated dude. And he loves it and everything's fine. But the label kind of wants us to maybe write two more songs or so that are more quote-unquote radio oriented. So we'll see what's gonna happen. I think we already have enough of what we need for the album... Maybe they're right. Who knows? Maybe we go and we write two more songs and the songs end up being great. And it can't be a bad thing, right?!"